TS-9, OCD, Hardwire Tuner, EH electric mistress, MXR 108 fuzz (or maybe muff pi) all on a diago pedal board with power station. I need to add a delay and have been quite taken with the new Nova repeater, however i keep hearing that everyone prefers analog delyas such as the EH memory man, I want something gig friendly so tap tempo is very high on the list, as is the ability to be powered from the power station, any suggestions? First of all: Tubescreamer and OCD?!? Two overdrive pedals? I think the OCD does everything a tubescreamer does but that's your call...You could save some money if you don't need them for diffrent things! 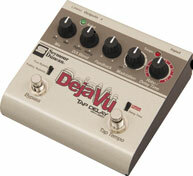 An analog delay will sound much fuller and warmer while a digital delay has more tweaking options. Analog delays are a bit limited with delay speeds and such while digital delays sound thinner and more sterile compared to an analog one. I really love the new MXR Carbon Copy delay, it's fully analog with a beautiful sound and surprisingly versatile tweaking options for an analog pedal! It's no wonder that it's already on Slash's and Gary Moore's pedal board!!!! My preference would be Analog. I haven't shopped for pedal in quit a long time so I'm not sure if you can get one with Tap tempo function. Also try and find something that is true bypass so you don't kill your signal with all this chained together. I have always found Analog to be a much more natural, warmer sound. Digital can become a little thin and sterile. Check out the electro harmonix stereo memory man with hazarai. Basically a digital version of the analogue deluxe memory man, with many awesome features. 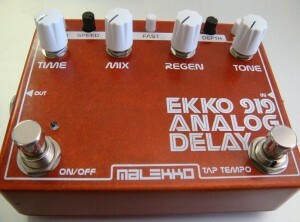 Includes a filter knob to fatten up the delays and sound more analogue. My favorite pedal out there, hands down. Gear: Fender American Deluxe Stratocaster, Gibson '67 RI Flying V, Mesa Boogie F-30 112 combo, crazy pedals. I think TC Nova is a really good digital one, but i agree to that an analog is warmer, but then its a question of what you should use it for. I mean, just for adding a lttle delay in the background of the sound, there's no need for spending a lot of money. I own an old Boss DD-2 and it works fine in live situations. The TS9 is a really nice bluesy pedal, but it just doesnt push my amp hard enough, hence the OCD as well for more rocking sounds, im getting an 18v supply for the OCD as well which should improve things further. I looked at the Carbon copy but its very sparse on features, which does put me off a little, I suppose just for a bit of trail it would be ideal but the nova has features that just appeal to me. there are some with tap tempo, I beleive the diamond memory lane has one but its a lot of dough for a delay pedal, plus its huge! Yeah I checked this out, very cool pedal but probably a lot of features I wouldnt use, i like the 9v opration though, maybe ill revisit this one. Seems to have all the bases covered but I cant find a price on them yet, let alone find one in the uk! it might be worth just getting a boss or something until this is available. 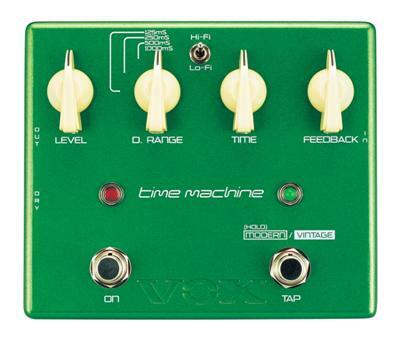 I recently got me a Vox Time Machine, it has tap delay, up to 6 seconds delay time, and a modern/vintage mode to choose either digital delay or simulate the warmth of an analog unit. Give it a try in your shop if you can. The best Delays I've tried is the T-REX Replica and the Mad Professor Deep Blue Delay. A little more than the Nova at around 200 pounds but seems to tick every box I wanted and take away the decision about analog or digital because its both! also love the true bypass or buffer mode for trails, excellent bit of kit. I'd go for either the T-rex replica which has extremely many features. I believe it's a hybrid of digital and analogue. Boss TU-2 Tuner, Homebrew CPR Compressor, EHX Small Stone, Maxon OD-9 Overdrive, Mad Professor Mellow Yellow Tremolo, Boss DD-2, Carl Martin DeLayla XL, TC Electronic SCF1 Chorus/Flanger/Pitch Mod. Well, it is a very nice pedal, but its still digital, and its nearly 320 pounds, way, way too expensive. I'll check out the carl Martin, but I think the SD has me sold now. Analog delays will cost you more, specially the ones packed with features like tap tempo or modulation. I am getting analog delay stomp soon, so I investigated quite a lot in the boutique and mainstream categories. I will give you some pointers if you can tell us whats the budget. This is the main thing that determines the stomp you will get, and I can narrow down the search a lot (since there are quite a few delays out there).